This is an overview of my Hallmark Kiddie Car collection. These are approximately 1/8 scale heavy metal reproductions of peddle cars, planes, trikes, wagons & scooters produced from the 1920's through the 1960's. These models steer, peddles turn the wheels, some have working lights and other movable and removable features. These high quality reproductions were sold by Hallmark from Oct 1992 to Sept 2001. Beginning in 1994, Hallmark began including an Information Card in each box and the Luxury Editions came with a Certificate of Authenticity showing the edition size and the unique number assigned to that car . . . which was also stamped on a plate attached to the bottom of the car. 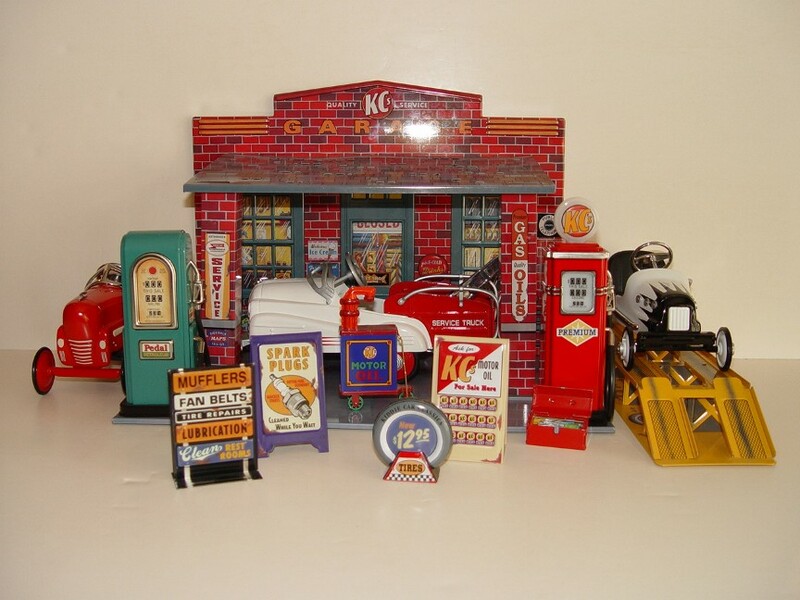 If you are doing research, the Collectomaniacs web site is an excellent reference for Kiddie Car Collectors as images of all the cars and accessories are shown with a description . . . scroll down to the bottom of the Collectomaniacs page for the Kiddie Car links. My site only shows my collection. Open Edition: These designs are not numbered, but they were retired on a regular basis. Once a design was retired, the mold was taken out of production and that design was no longer available to retailers. Limited Time Editions: These designs were available only until the announced retirement date. Numbered Editions: These individually numbered collectibles were issued in sequential production editions limited to 9,999 pieces. For example, a piece marked 2E/3255 means that this is the 3,255 piece of the second edition of that design. Numbered edition designs were available only until the announced retirement date. Limited Editions: These were individually numbered designs limited to a pre-determined edition size. For instance, an edition size of 24,500 indicated that a maximum of 24,500 pieces were produced. Once these pieces were sold to Hallmark retailers, the design was retired. Luxury Editions: (aka: Luxury Limited Editions) These individually numbered designs were limited to a predetermined edition size. Edition sizes would vary and were announced at the product issue date. As showpieces of the collection, they feature more elaborate designs and added touches. Once these pieces have been sold to Hallmark retailers, the design was retired. Don's Sign, Streetlamp, Parking Sign, Street Signs (Gillham Rd. & Main St. and Pedal Car Blvd. & Main St.) and Stop Sign. When the automobile made its appearance, the pedal car soon followed. Pedal car history goes back to the 1890's when most were modeled from the real cars on the road at the time. Since their conception, pedal cars were all kids wished for. But at the turn of the century, their cost meant they were playthings for only wealthy families. With many families reeling from the financial devastation of The Great Depression, pedal cars were often toys for upper class children. Those not so fortunate played with basic homemade ride-on toys. In the 1920's and 1930's the wealthy were catered to when it came to buying pedal cars since they were the primary buyers. No pedal cars were produced in the mid-1940's when all metal production was directed to the World War II effort. Reaching the peak of popularity in the late 1920's and early 1930's, pedal cars experienced a resurgence in the 1950's to 1960's with chain-driven models. With postwar prosperity in the 1950's, pedal cars grew more popular and were available in all major stores. From the early 1920's through the late 1960's, pedal cars, like automobiles, were produced in many different models and colors. Designed to incorporate the most current trends of the automotive world, pedal cars featured working lights and horns, moveable windshields and ragtops, chrome detailing and hood ornaments, and white wall tires and custom paint jobs. 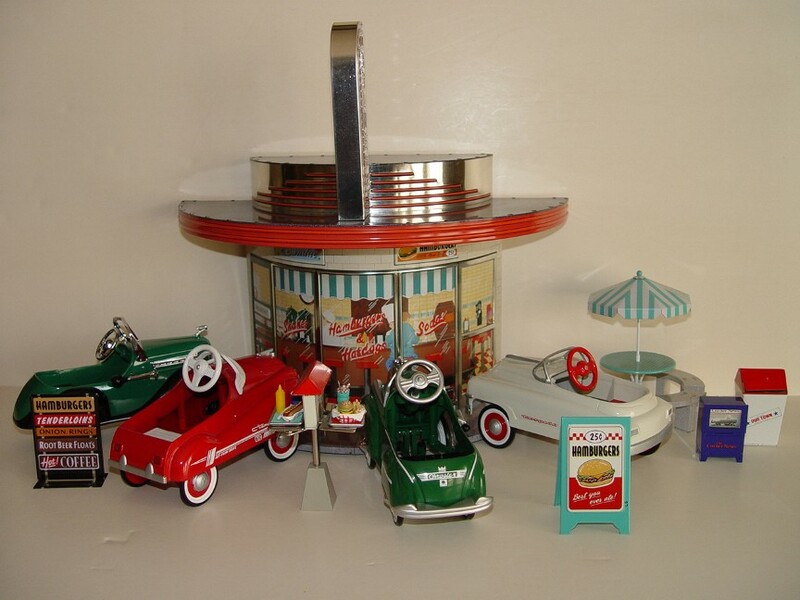 Later pedal toy manufacturers recognized that there was a huge market for these pedal car ride-on toys and extended their business strategies to include manufacturing of other pedal toy products like pedal planes, namely the Red Baron, Shark Attack and Fantasy Flyer. Manufacturers later extended their idea of the pedal car to all things pedal, including pedal trains, pedal trucks, tricycles, and even die cast models for those who just wanted a model of the models. The idea of owning one of these pedal toys is trendy to this day as many pedal toy owners are not only purchasing these products as gifts for their children, but also as collectible items. They have an emotional attachment to the memory that these cars bring to them. In the 1960's, a fascination with space and air travel, the ubiquity of plastics, and new safety standards for toys brought an end to widespread metal pedal car production. In the 1970's the plastic car was introduced and the traditional steel pedal cars almost faded out of existence. Children's car manufacturing continued in plastic, but the design of the vehicles no longer captured the aesthetic of adult automobiles. The pedal car era began almost as soon as the world embraced the automobile and ended when metal toys gave way to plastic. Today as in the past, the joy of purchasing these pedal products is that they have a fabulous build quality unlike the plastic models that came out in the late 1970's. The pedal cars manufactured through the 60's were constructed with pure steel, no plastic parts. This durability, along with the exquisite style and detail of the early models make these early peddle cars highly collectable.